Designed in the USSR thirty years ago, the Tetris video game went on to become a genuine cultural phenomenon around the globe, earning billions of dollars on the way. Modern Russian video game designers have produced many games since then, but have been unable to even come close to the success of Tetris. Today it seems almost childishly simple: A series of differently-shaped blocks falls from the top of the screen at ever-increasing speed, giving a player less and less room for maneuver unless they can drop the puzzle-like pieces into place by rotating them and moving them from left to right. Yet for the time, the concept of this devilishly addictive video game puzzle, named Tetris by its creator, Soviet game designer Alexey Pajitnov, was something radically new, and a prize that was eagerly fought over by the rising stars of the mid-1980s video games industry. The game was destined to become one of the most iconic titles in video game history, played by millions around the world on a variety of different consoles and platforms. “The importance of Tetris for the gaming industry is hard to overestimate – in fact, the release of this game for Game Boy handheld consoles kick-started the advent of ‘pocket games,’ which in the age of Angry Birds and the like are known as mobile games,” said Alexander Kuzmenko, head of Games.Mail.Ru, Russia’s largest online games portal. “Everyone was playing it while I was at university, including my Russian professor, who would comment on how Russians excelled in math and science,"said U.S. citizen Hamilton, who first entered the industry in 2008 by localizing casual games developed in Russian by St. Petersburg-based Nevosoft into English. Hamilton also stressed the importance of the game for the nascent video games industry in the USSR, and later Russia: "Tetris was the first game developed in the Soviet Union that was exported to the U.S. and other western markets. It really opened the door for a number of Russian developers who continue to make great content for global markets,” he told RBTH. Pajitnov assembled the first Tetris prototype on June, 6, 1984, but he then continued to refine his new game for several months. Hence, the real birthday of this brilliant puzzle – at least according to most Russian sources – is July, 18, 1985. Indeed, it was in the summer of 1985 that the updated, color version of the game for IBM-compatible computers started circulating among Pajitnov’s friends and colleagues at the Dorodnitsyn Computing Center of the Soviet Academy of Sciences in Moscow. Thus began the rise of Tetris – first in its country of origin, and later around the world. In those days, the exports of Soviet computers and software were officially controlled by the Electronorgtekhnika state corporation (also known by its shorter name, Elorg). However, even before any actual agreement was signed with Soviet officials, several foreign companies released unlicensed versions of the game and started selling the rights to something they did not really own to each other. The complex tangle of issues, some participants of which flaunted their personal connections with Soviet leader Mikhail Gorbachev, finally ended years later, with Atari acquiring the rights to an arcade version of the game and Nintendo obtaining the home console version. In 1996, Pajitnov, having moved to the United States by then, created The Tetris Company and restored the rights to the game to himself, later signing an agreement waiving any further claims with the now-private Elorg. Ever since, the designer, who made very little money from the game’s popularity during the 1980s, has received royalties from all new releases of Tetris (including the latest version for new hardware platforms by Ubisoft). This represents a major issue for Russian programmer Vadim Gerasimov, who – at the age of 16, no less – had helped Pajitnov to port the game, originally developed for the Elektronika-60 Soviet computer, to the IBM PC. There are numerous versions of Tetris on the market today, spanning virtually all kinds of personal computers, home gaming platforms and handheld consoles. It would simply be impossible to count the actual number of copies sold, all the more so since a lot of them were distributed free as pre-installed apps in various devices. Pajitnov’s invention became the first game ported to mobile phones, appearing on the Hagenuk MT-2000 model in 1994. In the late 1990s, Russia was invaded by Chinese handheld electronic game devices named Brick Game, which also included Tetris as the main game. But perhaps the biggest contribution to the gaming industry made by Tetris was its release on the Nintendo Game Boy portable game console. The puzzle game helped the Japanese company to beat the competition and solidify their leadership on the multibillion handheld consoles market. Tetris is still available for the Nintendo 3DS, the Game Boy’s modern descendant, albeit with a number of additional features, such as a multiplayer mode supporting up to eight players, and augmented reality modes. 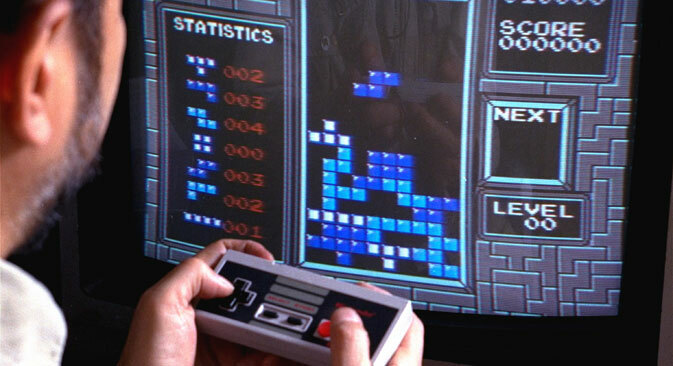 Western companies, including Nintendo and American developer Spectrum Holobyte, began adding some “Soviet flavor” to Tetris back in the late 1980s as the game continued to grow in popularity. Nowadays, Tetris is regarded as one of the all-time classic video games, akin to Pac-Man and Space Invaders, and is even referenced in art. In 2012, the Museum of Modern Art of New York City acquired Tetris and 13 other video games, which have been included in the museum’s collection. Alexey Pajitnov created about a dozen games after Tetris, but those titles are far too obscure for modern gamers to be familiar with. The only exception is Hexic, a puzzle game designed in 2003 and regularly re-released for new platforms; this time, the player’s task is to assemble clusters of hexagons of the same color. Although Pajitnov is often accused of being a gaming one-hit-wonder, he retorts by pointing out that Tetris spawned a whole new genre of games. And in that sense, any modern tile-matching puzzle game, from Bejeweled to Candy Crush Saga, owes at least some of its success to the ancient Soviet title.